Dr. Carla B. Dimalanta, Professor 10 at the National Institute of Geological Sciences and Asst. Vice President for Academic Affairs (Research) of University of the Philippines, Diliman, is one of Metrobank Foundation’s ten Outstanding Filipino Award recipients in 2018. She is an alumnus of the University of Tokyo, where she finished the D. Sc. program in Earth and Planetary Sciences in 2001 under a MEXT Research scholarship. 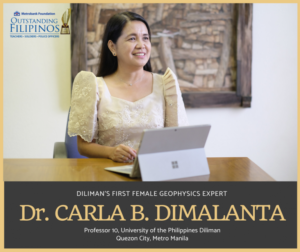 The only female exploration geophysicist with a doctoral degree in the country, Dr. Dimalanta has received lucrative offers to work abroad over her 25-year career but is decided to stay in the Philippines to mentor graduate students in the field of geology, continue her research work and share its results, and help solve local problems by providing practical, community-specific measures on climate change adaptation and disaster risk management. Her often cited researches include the application of geophysical methods in identifying possible sources of groundwater for the coastal communities in Romblon in 2009; the assessment of landslide hazards in Mindoro in 2017; and just recently, the use of geophysics tools in investigating gold mineralization in the Masara Gold District in Eastern Mindanao. Dr. Dimalanta has also worked in coordination with the National Historical Commission in carrying out ground penetrating radar surveys post Bohol earthquake in 2013; and in looking at the geophysical data used to support the country’s claim to delineate its territorial boundaries in relation to the International Law of the Sea. This year Dr. Dimalanta also received the Outstanding Research and Development Award for Basic Research (Eduardo A. Quisumbing Medal) from the DOST for her project that generated the most recent data on the geologic evolution of the Visayan Region.